Zombie Simpsons has enough systemic and repetitive problems that I would never try to identify one that really breaks it, but the way that none of the characters ever act like themselves is especially annoying. Gaping plot holes, weak and joke free dialogue, lazy product parodies, characters appearing out of nowhere, these are all problems. But when they take characters we all know and love and have them act like versions of themselves that have suffered personality altering brain injuries it really drives home just how different this show is from The Simpsons. Just in this episode we see Skinner completely unable to run a school assembly, Marge be rude to strangers, Lisa easily fall to pieces, and Homer be athletic, overly sensitive, strangely smart, and competent. I’m not sure who these people are supposed to be anymore. Each and every one of them can act wildly differently depending on what specific scene they’re in, which means that almost no matter what they do it’s too random to be funny or interesting. Security camera footage has better character consistency and development. – Regular old, time killing Zombie Simpsons couch gag. Feh. Can we dig up Charles Schulz and have him do one? – It’s not a big deal or anything, but real Skinner would never have put up with the kids shouting things from the stands while he’s talking. – I was bored with the Lincoln-Douglas scene. Then there was a mechanical backboard arm that looks like it should be in Futurama, and now I really just want it to end. – Ooh, a joke about Subway Jared. Timely. – Watching incompetent Skinner flail about is really painful. Not as bad as happy, incompetent Burns, but very bad. – A Jerkass Homer montage, that’s what this episode really needed. – So the contest wrapped itself up just as stupidly as it began with there being a tie. I’m sure glad we spent a bunch of time on getting it set up. 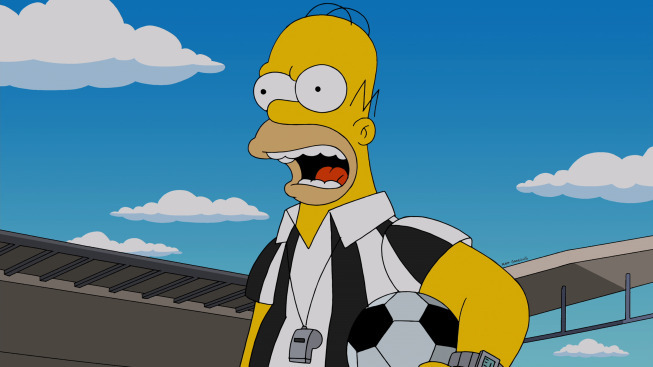 – FIFA isn’t exactly hard to mock, but Zombie Simpsons managed to botch it with its usual methods of expository jokes and senseless scenes. Well done. – This scene in the airplane with the Marge’s tablet has it all: takes too long, joke free, and makes no sense. – Ugh, if they’re going to repeat the joke from “Marge vs. The Monorail” where the whole town is empty and Snake robs it with Luxembourg, they could have at least made a Luxembourg-ish Snake. Now it’s not just a direct repeat, it’s a nonsensical direct repeat. – Homer has wandered out of a restaurant because the plot was getting bored with itself. – The gangsters talking about just having “two very good ways” with money and guns was almost funny. – Onto our second montage nice and quick. – “Dad, is it hard for you to turn these bribes down?” – Thanks, exposition Bart. – If they did these scenes where they try to be ironically detached about how cheap their plot turns are once or twice per season, that’d be one thing. But they do this every damned week. Bart and Homer might as well be looking directly at the camera to explain what’s going on. – “Where are you going?”, Homer then describes exactly what he’s gonna do. – Hey, here’s Lisa, whom we haven’t seen for the last ten minutes or so, to help wrap things up. – And now we’re treated to a minute of them telling us exactly how they feel. 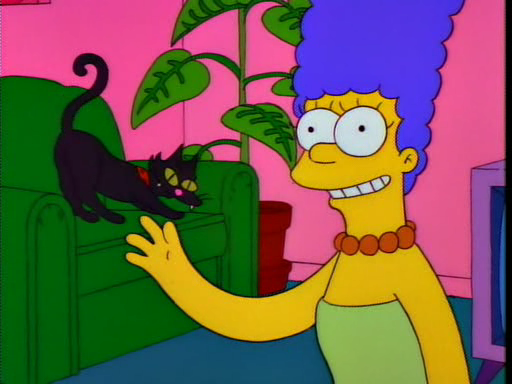 – Here’s Marge to protect Homer from the gangsters. Where did she come from? Did she know what was going on? It’s best not to ask. – And now that guy’s mother is there. Plot conflict resolved! – Despite all the drawn out scenes, they still came in way, way short, so we got treated to the family taking a random trip down the Amazon to see Krusty. Yeesh. Anyway, the ratings are in and they are just as bad this week as they’ve been since they came back with that double episode at the beginning of March. Last night just 3.94 million viewers wished they were watching a 0-0 tie between Mexico and Portugal. That’s almost identical to last week’s 3.93 and is good for fifth place on the all time least watched list. This week’s historically terrible number has also pushed Season 25’s average total viewership to a mere 5.45 million viewers, which puts it just below Season 24’s 5.47 average. I don’t feel like looking it up or anything, but my strong suspicion is that this is the earliest (just 16 episodes in) that any season has claimed that title. Barring a miracle, Season 25 will continue the Zombie Simpson tradition of being the least watched season ever. The only real question now is how low it will sink. I doubt it’ll go below 5 million, but they are really hitting bottom this spring, so anything is possible. Happy 20th Anniversary to “Bart Gets an Elephant”. Original airdate 31 March 1994. I have often wondered what would happen if you took a nuclear safety inspector and had him referee world class soccer matches. Good thing these writers are always one step ahead of me. 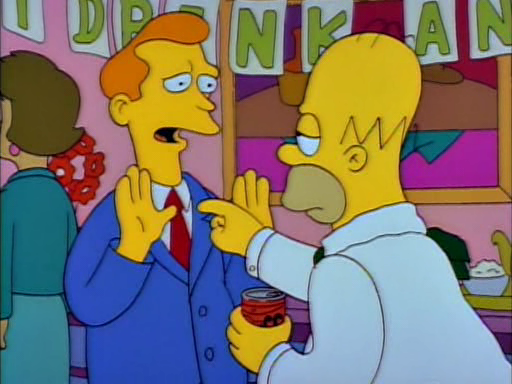 We’ve got two links this week where the one, the only Charles Montgomery Burns is held up as all that is soulless and wrong, one about finger tenting being a sign that you might be a villain and the other from the race for Illinois governor. Other than that, things got shortened this week because of the announcement of new Lego figures. Everyone with access to Twitter or the internet made mention of it, and there are some pretty neat ones (Maggie with Bobo, for example), but all that noise did obscure other stuff. We’ve also got a cool interview with Greg Daniels, some great fan art, a sweet Duff t-shirt, a couple of women dressed up like Marge, and Krusty-based insults all tucked away down in Canada. 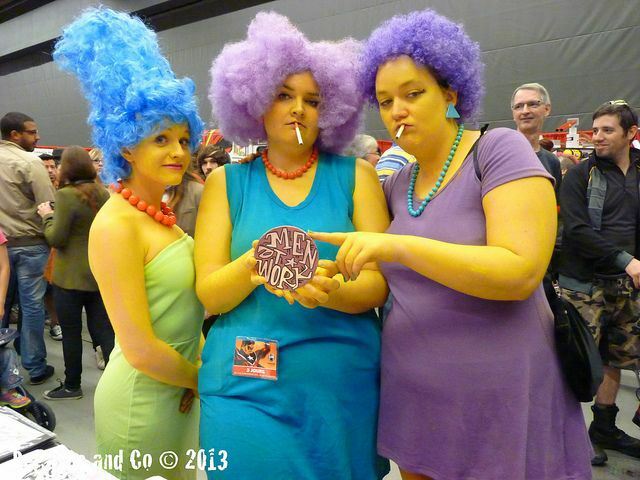 Lookin’ Good: Marge Simpson Hair And Makeup IRL – Someone took a model and made her up to look like Marge. It’s a little creepy. There’s also YouTube of wig construction and makeup application. All three of them are just perfect. Patty & Selma look identical (wouldn’t surprise me if those two really are sisters) and grumpy while Marge is kinda trepidatious about whatever it is that’s eating her sisters. Bravo! D’oh: Quinn’s ‘Simpsons’ ad blocked ‘on copyright grounds’ – One of the nice things about not living in Illinois is that you don’t have to care about who the governor of Illinois is, but the residents of the Land of Lincoln were treated to their sitting governor comparing his opponent to Mr. Burns last week, so they got that. Round 105: I Married Marge vs. New Kid on the Block – Whew, Season 3 vs. Season 4 is tough. Doh! Ex-Simpsons writer Greg Daniels reveals how he almost missed opportunity to adapt The Office for US – Daniels was in the UK and gave a rundown of his career at a comedy festival. Dear Miss Lonelyhearts: My husband has a fringe of long hair like a clown. He wears a hat thinking people won’t notice and they will still think he has flowing locks like he did when he was a rocker and played in a band a decade ago. I don’t say anything about it because I love him and he is beautiful to me, any which way. Yesterday, a neighbour came over to help my husband change a tire in the driveway and I heard him say, “Hey Krusty, need any help?’ My husband is familiar with The Simpsons and Krusty the Clown. He said something very rude back and the guy sauntered off home shaking his head like my husband was an idiot. Zoella in Homer – More Simpson fashion in the wild. New in. – An awesome Duff t-shirt, and a few more pics. In fact, I developed a friendship with a guy in high school largely revolving around one question: “Did you watch The Simpsons last night?” New episode or repeat: it didn’t matter. We’d sit around recalling setups and punch-lines and laugh all over again. It’s amazing how formative those years are. I still retain Simpsons memories 20 years later, and in fact just two years ago spent the better half of an evening dredging them up with a friend on a restaurant patio. LEGO ‘The Simpsons’ Minifigure Collection – Burns with a plutonium rod and Grampa with the “Old Man Yells At Cloud” newspaper are nice touches. Looks like ‘The Simpsons’ predicted Facebook’s purchase of Oculus – Not quite, but it’s still pretty funny. I just want to play virtual darts and virtual pool so I can get in a virtual fight. The 8 Ball 03.25.14: Top 8 1990s Arcade Games – The arcade game comes in at #3 here. Muppets Most Wanted: When did finger-tenting, or steepling, become a symbol of evil? – Mr. Burns, for obvious reasons, is the headline example here. Ten Celebrates The Simpsons 25th Anniversary – With a LIVE Countdown – Aussies get to vote on which episodes will be broadcast for a 25th anniversary celebration. 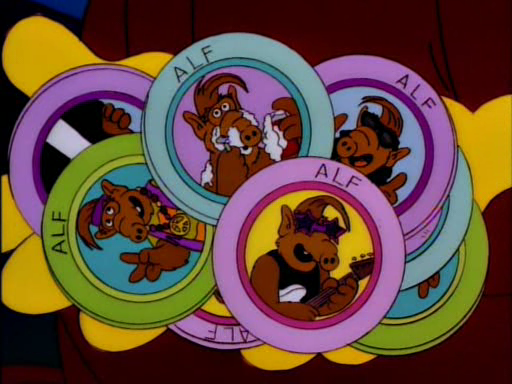 So which is your all-time, favourite Simpsons episode? – Another link to the same promo. The actual choices have a lot of Zombie Simpsons, but down in the comments they don’t so much as rate a mention. Figures. The 14 Best Simpsons Music Cameo Moments – Only one entry is from Zombie Simpsons, and the post itself agrees with us, plus there’s lots of good YouTube. If The Simpsons and Farscape collided :) – I think I’ve linked this before, but it’s still pretty neat. It reminded me of that Simpson’s episode…Mendoza!!! Mendoza!!! And I think the boat was called “Live Forever.” We talk about that all the time. Rainer Wolfcastle. 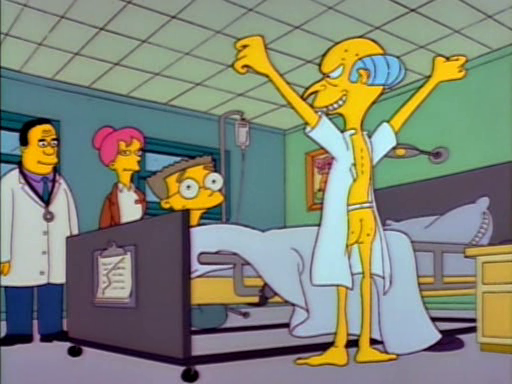 If you have a character who’s retiring and they get shot you cannot help but be compared to The Simpsons. Usually, an episode of The Simpsons follows the family in their every-day lives, with something bizarre happening to them (Bart has to live in a bubble, Lisa becomes a buddhist, Homer accidentally joins the army…), and occasionally they will go somewhere outside of Springfield, wether it be Canada, Africa, or space. It was great at first, and I would watch it every night as a loyal viewer. After a while though, I felt that the episodes just started to become a little thin, less fun and less original.